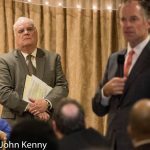 Mayoral candidates Bo Dietl, Michel Faulkner and Paul Massey appeared in Howard Beach Thursday night, courting support at the Queens County Conservative Party Spring Dinner. The Conservative Party will select its mayoral candidate shortly, with the individual county organizations commencing discussions this week and a final selection expected by the end of May. 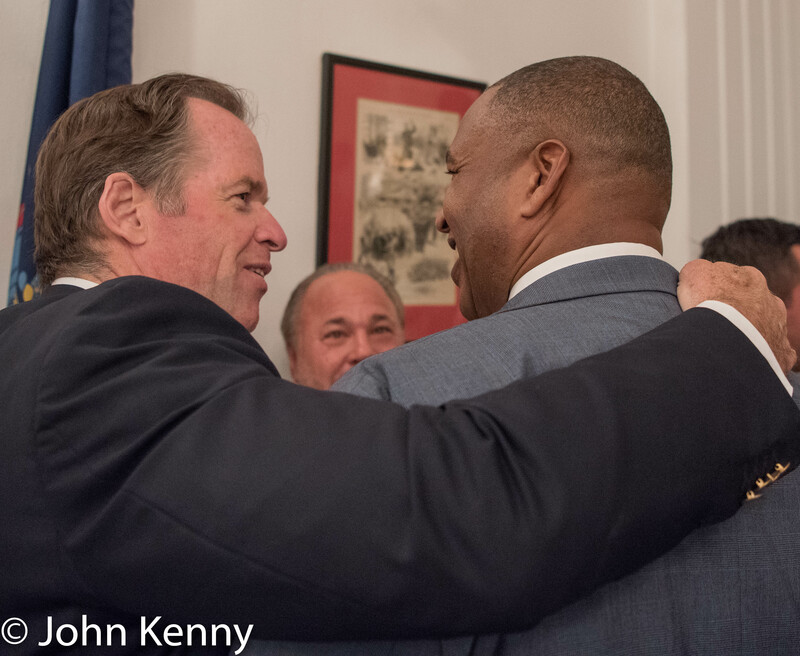 Their appearances and quest for the Conservative Party nomination had an additional subplot; Dietl’s controversial remarks on Mayor de Blasio’s wife the night before, Massey’s statement condemning those remarks and Dietl’s demand for an apology from Massey. Assembly Member Nicole Malliotakis is also seeking the Conservative Party nomination, but did not attend this dinner. “They can’t control the Bo” said Bo himself, speaking today at a press conference on 34th Street, answering his own question of why “they” do not want him to run for mayor. 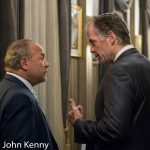 Bo Dietl continues trying to extinguish the firestorm that erupted following his Wednesday night comment that a judge who heard his lawsuit against the Board of Elections “looked like Charlene de Blasio (sic) and as soon as I saw her … I knew I had a problem.” He made a similar mea culpa last night at a Conservative Party dinner in Howard Beach. 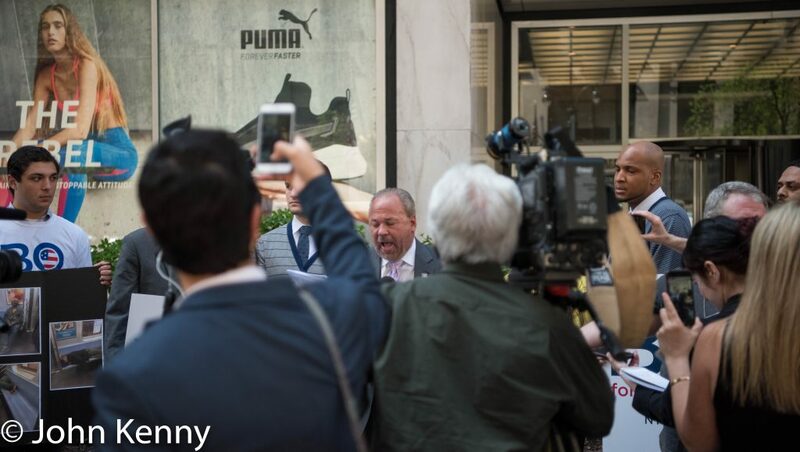 Dietl began his press conference by reading a lengthy statement denying that he is a racist, recounting his humble origins and work as an NYPD detective, touting his business success and attacking the New York Post and the New York Daily News. 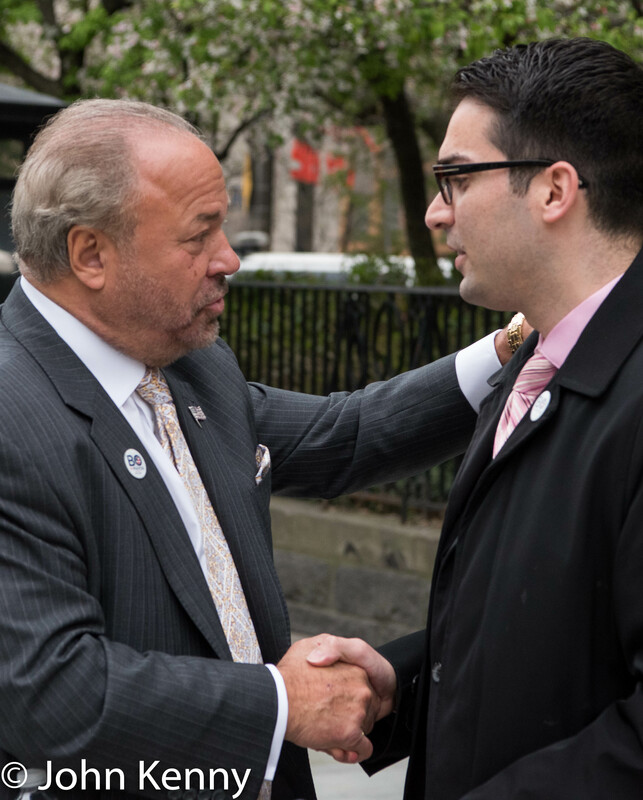 The Post editorial board has called for Dietl to drop out of the race and a Daily News columnist has been harshly critical of Dietl. Dietl unambiguously asserted that he’ll stay in race through November, even if he does not get a Wilson-Pakula allowing him to run in the Republican primary. 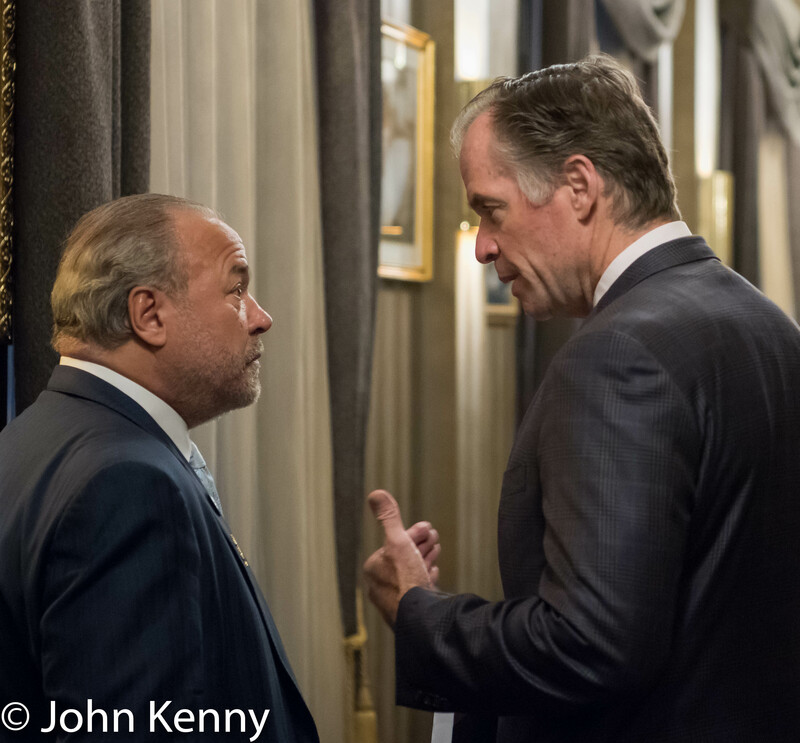 Bo Dietl and Paul Massey discuss Dietl’s comments, during the Queens County Conservative Party Dinner on April 27, 2017. Republican mayoral rivals Michel Faulkner and Paul Massey have often proclaimed their affection for one another, but Faulkner has been increasingly critical of Massey. At the Manhattan Republican Party mayoral candidate forum last night Faulkner had some harsh comments about Massey. 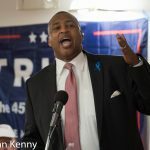 It was a Republican wrestling match as four candidates seeking the Republican nomination for mayor came together last night, participating in a forum hosted by the Manhattan Republican Party at the Upper East Side’s Metropolitan Republican Club. Smiling, joking and mostly making nice, they harshly attacked Mayor Bill de Blasio as the four engaged in their first group forum. They threw a few barbs at each other, and one managed to draw harsh condemnation afterwards for a comment involving Mayor de Blasio’s wife, but they mostly tried to push past each other as they sought audience and press attention. Michel Faulkner, Nicole Malliotakis and Paul Massey are Republicans seeking their party’s nomination while Bo Dietl is a former Republican seeking a party waiver to run in the Republican primary. 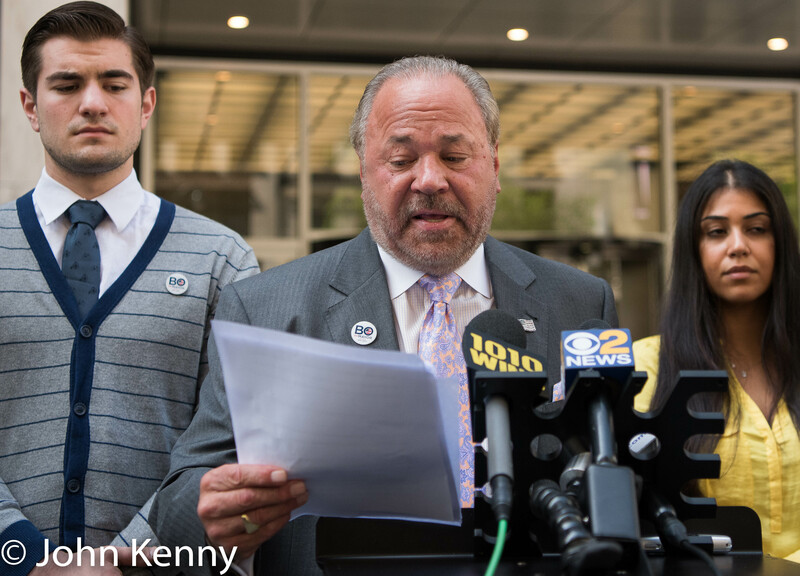 The forum was important for all four, but especially critical for Dietl as he seeks a Wilson-Pakula; dispensation from at least three of the GOP county chairs to run in the Republican primary. 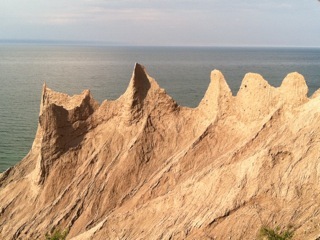 All five were present, part of an overcapacity crowd and large press contingent. 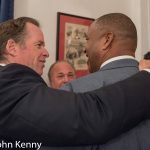 Michel Faulkner was asked (by Politico’s Azi Paybarah) about Dietl’s comment during a post-forum press Q&A, terming it “offensive” and “could be borderline racist.” Faulkner nonetheless unambiguously expressed affection for Dietl, concluding his remarks by saying “put that down, make sure you say ‘I love Bo. '” The brief exchange also featured a interruption by a Dietl staffer, which Faulkner brushed aside. 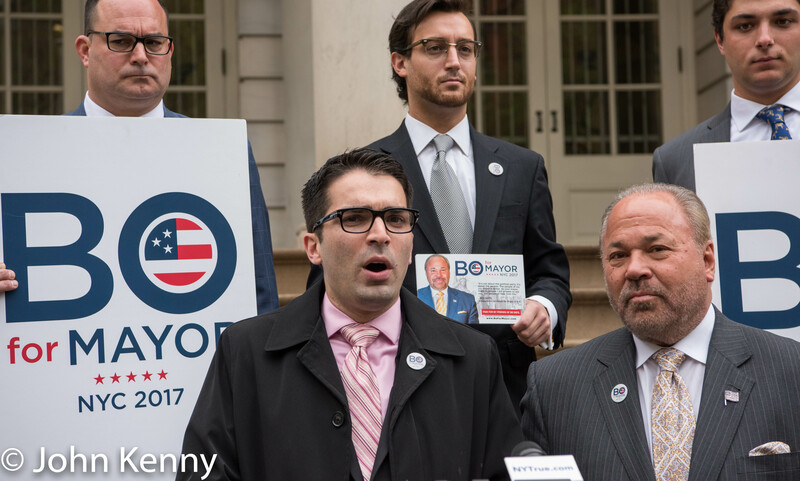 New York City Council Member Eric Ulrich today endorsed Bo Dietl for mayor, supporting Dietl in a race that he may not get to run. 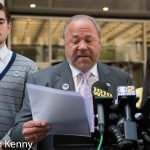 Dietl’s hope of running in the Republican primary depends on receiving a waiver, known as a Wilson-Pakula, from the Republican county committees in at least three of New York City’s five counties. This was a good get for Dietl, attracting a decent amount of press interest in a race that has attracted limited attention. 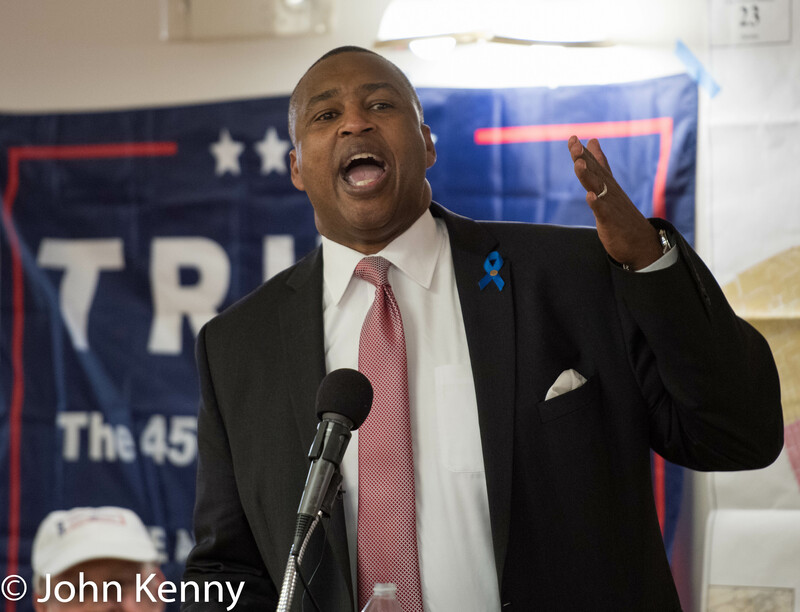 There’s a very small pool of Republican elected endorsements available, as Ulrich is one of only seven nine elected Republicans (excluding President Trump) from New York City. He’s the second to endorse a mayoral candidate, with Assembly Member Ron Castorina having endorsed Paul Massey. 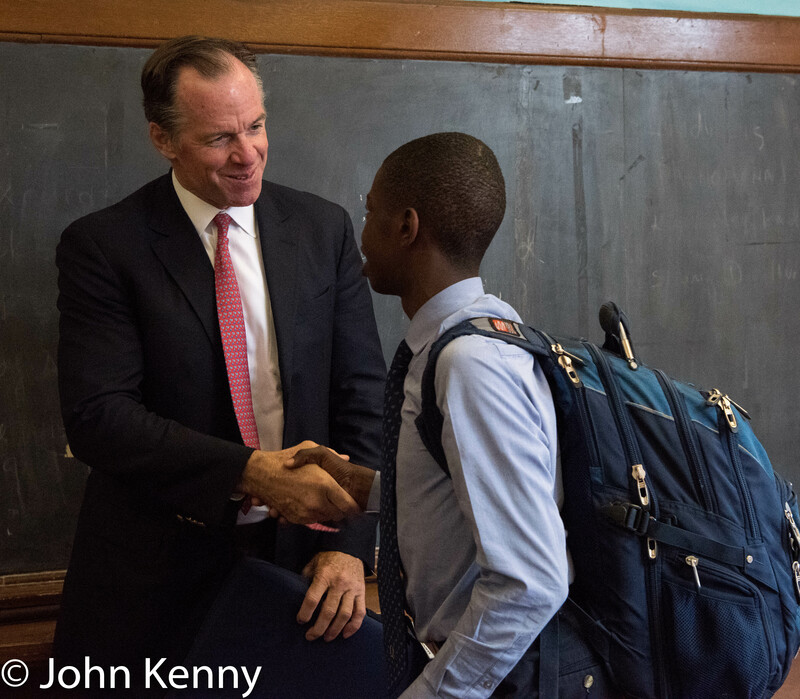 Republican mayoral candidate Paul Massey made a school visit today, going to Cristo Rey Brooklyn High School for a tour and discussion with students as he began an extended effort at demonstrating deepened policy knowledge. 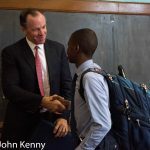 Massey, who has often appeared unfamiliar with significant City policy issues, has said that over the next several weeks he will unveil an “Urban Innovation Agenda,” via a “series of in-depth policy proposals.” Today Massey discussed education reform. The press conference was held at Cristo Rey Brooklyn High School, a fairly new school created in the former home of a shuttered Catholic high school. Cristo Rey Brooklyn is part of a national network of 32 Catholic high schools created on the model of the first Cristo Rey high school, a Jesuit high school in Chicago. Each school is separately run, with Cristo Rey Brooklyn sponsored by the Sisters of Mercy and administered by a board of directors. Students work one day per week at jobs outside of school. Those employers, primarily large businesses and law firms, provide much of the school’s financial resources which in turn enables the school to modify tuition based on financial need and students pay as little as $100 per month. Massey has employed Cristo Rey Brooklyn students in his brokerage business and now in his campaign. He spoke enthusiastically of the school and its students. That’s how Paul Massey characterized my question of whether it’s fair that the Staten Island ferry is free while riders on all other New York City public transportation pay at least part of the cost. It’s a bit of a dicey question for a politician seeking support on Staten Island, but a reasonable topic and important in both transportation planning and broad budgeting for Staten Island services. Massey, on Staten Island for a press conference about the new ferry system, dismissed the very notion that it’s free. 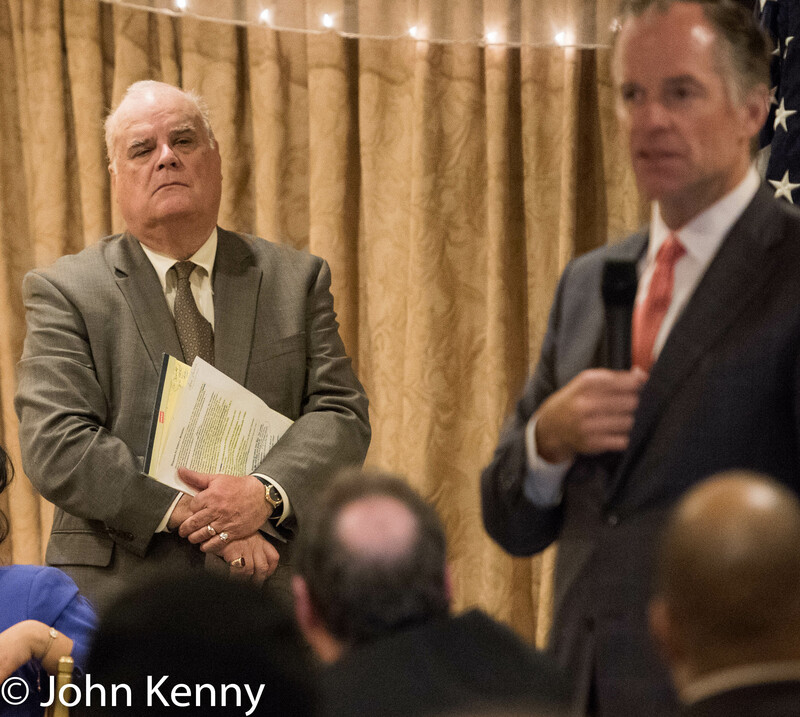 Republican mayoral candidate Paul Massey came to Staten Island this afternoon to offer a Staten Island-centric criticism of Mayor de Blasio’s plan for a new Citywide ferry system. 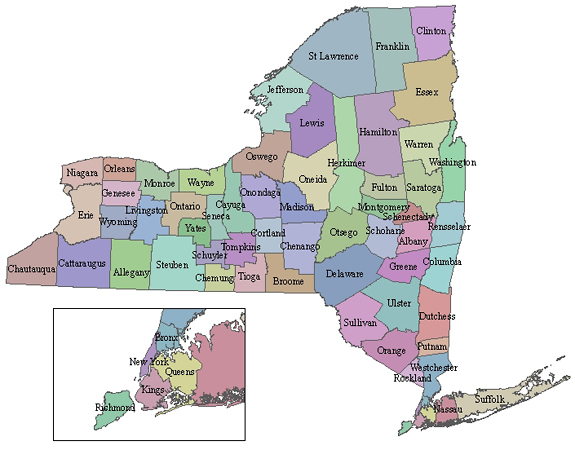 The new system, which will begin partial operation next month, does not include Staten Island. It’s wholly separate from the existing Staten Island ferry, which runs a single route between the Battery and St. George, and is planned to run broadly along the waterfront of the other four boroughs. Massey spoke at the waterfront in Stapleton, with the harbor and lower Manhattan spread out behind him as he demanded that Staten Island be added to the new system. Massey drew a larger press contingent than his prior Staten Island press conference, with the City Hall press corps settled in about two miles away for Mayor de Blasio’s Staten Island week. He’s improving on his knowledge of New York City government, but still reluctant or unable to talk in much detail. Responding to my questions Massey said that he otherwise thinks that the mayor’s plan is a good plan and he declined to address what the right pricing will be for the new ferry system. Like all New York public transportation it will be subsidized by taxpayers. Massey also rejected the premise of a question on the fairness of the Staten Island ferry being free of charge. Our photo gallery of Massey’s press conference is available here. 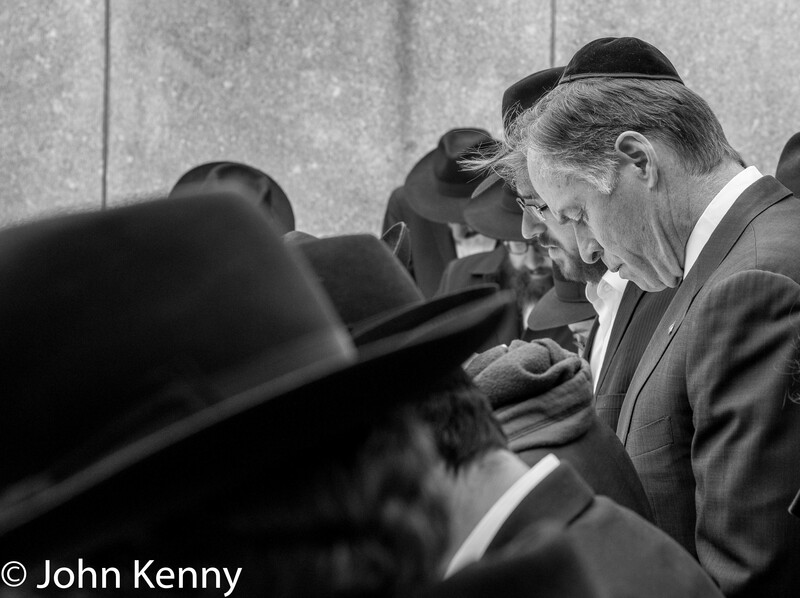 Republican mayoral candidate Paul Massey visited the Ohel Chabad-Lubavitch, the Cambria Heights burial site of the Lubavitcher Rebbe, Rabbi Menachem M. Schneerson, Friday. 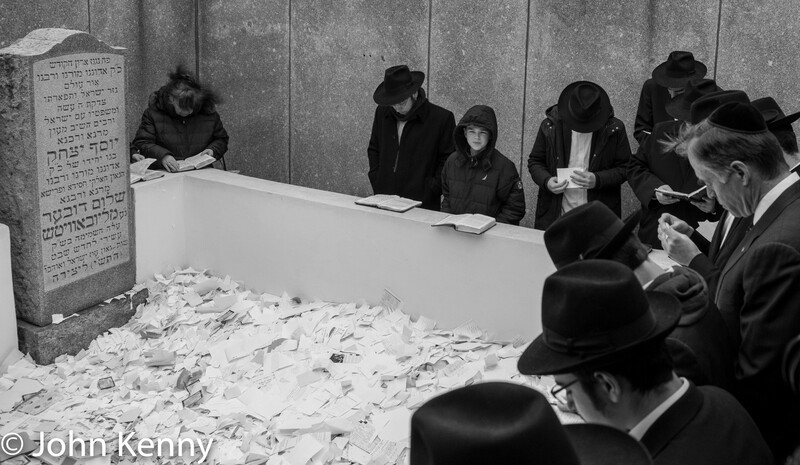 The Ohel, literally the “tent”, is a small square roofless stone structure built around the gravesite creating a space in which many devoted followers come to stand, pray and seek immersion in the Rebbe’s spiritual presence. The Rebbe, who died in 1994, was the Lubavitch leader and a significant presence in New York City’s political fabric. Mayoral candidate Paul Massey waded into the long running metzitzah b’peh morass today, as he was asked about it in a press Q&A during a visit the Rebbe’s Ohel, the gravesite of the late Lubavitcher Rebbe Menachem Mendel Schneerson. The ritual, in which a mohel, an adult male, draws blood from an infant’s circumcision wound with his mouth, has bedeviled Mayors Bloomberg and de Blasio. A small number of infants have contracted herpes through such contact with herpes-infected mohels, provoking public health officials to seek to limit or ban the practice. 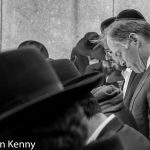 Update – Full Report: Our full report on Massey’s visit to Ohel Chabad-Lubavitch is available here.